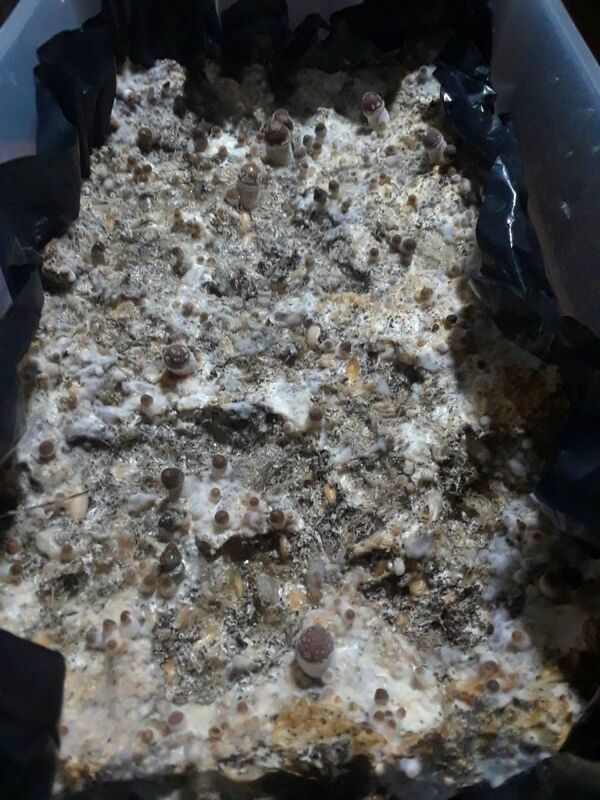 Looks like one of my tubs has an albino cluster, too soon to tell since they are pins but looks promising. 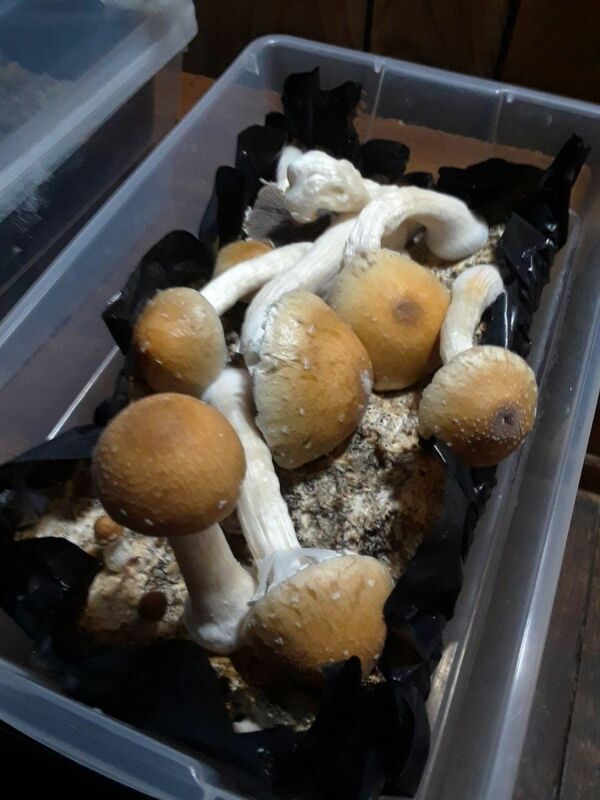 This is what my tubs usually look like after the second flush. Notice the yellowing of the sub. This tub was not dunked between flushes just heavily misted. There are times after misting where there are small pools of water in the valleys from previous flushes. Anything you would do different to keep the sub healthy through multiple flushes? 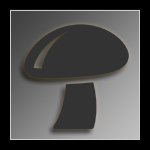 Just my 2 cents, but if there are pins forming where there is discoloration, that means the mycelium is still healthy... Water tends to gather towards the edges of trays, it's just some metabolites. Thats what i thought but its still nasty and many pins tend to abort. Maybe i should scrape after next flush. 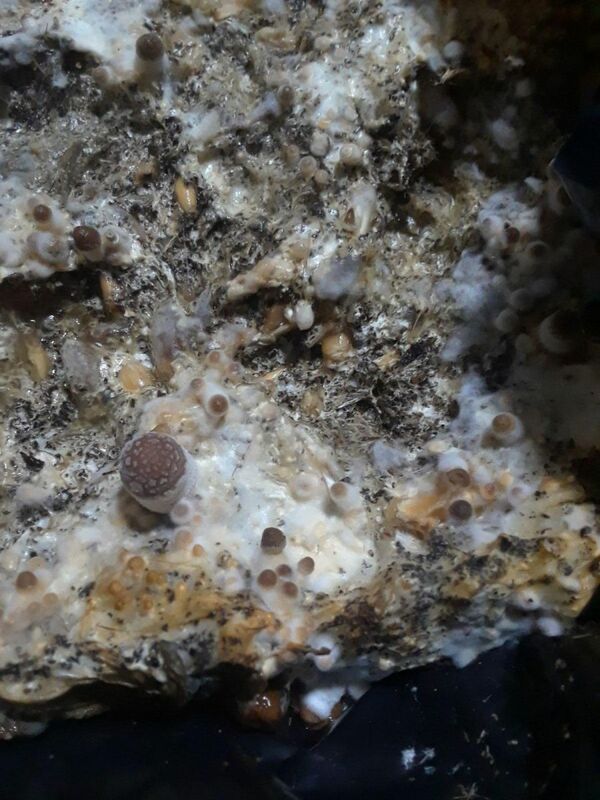 Albino cluster turned out to be myc encrusted pins. Instead of scraping it of, take a clean scalpel and remove the whole thing, only go as deep as necessary. I feel like scraping might just spread the stuff around if it is effecting the pins. Its really the whole top surface, I've scraped one back to white myc before and got anothe flush. You lose most of the pins that way but I'm losing them anyway. Doesn't seem to spread when i do scrape. Just second guessing myself on the scraping. I thought maybe my heavy misting between flushes was doing this but maybe its just age? Those are getting big my friend. Yeah its weird they decided to get fat on the 3rd flush. Any reason why they grew sideways? Looks like the lid was on it lol. I'm assuming they were just growing towards light. Do you know what happened to them being Albino? Also not sure if they were growing toward the light or had trouble supporting their own weight. I noticed that in albino cross strains, the albinos only pop up once in a while.